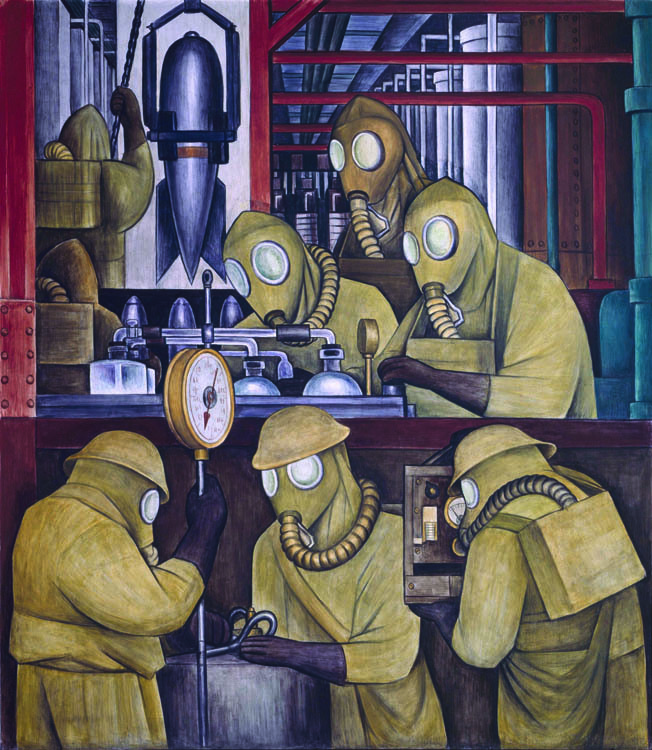 Iconic Artists: To piece together the massive Diego Rivera and Frida Kahlo in Detroit exhibit, the DIA obtained loans of artworks from numerous museums. The oil on canvas painting above, Frieda and Diego Rivera by Frida Kahlo, is on loan from the San Francisco Museum of Modern Art. Detroit has a special connection to Mexico. It’s more than the strip of Mexican-American restaurants that dot Bagley Avenue and Vernor Highway, and more than the city’s Mexicantown neighborhood, home to the largest Mexican population in Michigan. Despite our being on the opposite side of the border, Detroit’s bond with Mexico spans generations — and in many ways peaked for 11 months between April 1932 and March 1933 when two of the country’s most renowned artists of the 20th century were invited to the Motor City. 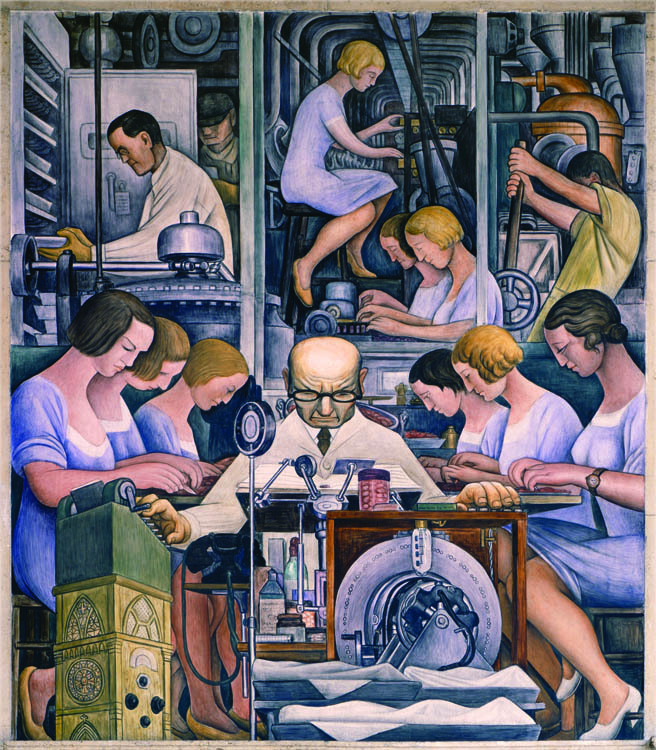 It was that year that Diego Rivera would paint his Detroit Industry frescoes that serve as the Detroit Institute of Arts’ prized centerpiece in its courtyard and cement his place as one of the most important commentators on capitalism in North America. His wife, Frida Kahlo, was at the time an unknown, aside from being Rivera’s third wife. But that changed in Detroit when she experienced a life-altering experience in a hospital bed at Henry Ford Hospital. Her identity as an artist exploded from that bed when she created seven works that blend surrealism, feminism, and vulnerability — a style that to this day defines her work and inspires countless female artists. This March, the DIA will seek to examine that decades-long relationship between two of Mexico’s most iconic art figures and Detroit with its multimillion-dollar Diego Rivera and Frida Kahlo in Detroit exhibition. The show will feature nearly 70 works between the two artists, taking visitors on a journey to 1930s Detroit, using the sketches, renderings, controversy, and anguish of the time as their guides. 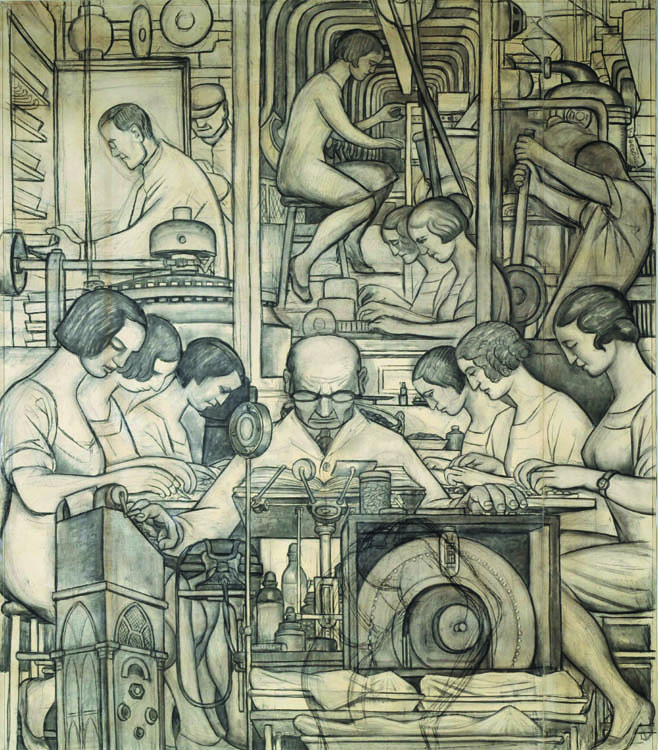 The rare Industry preparatory drawings by Rivera have not been shown in nearly 30 years, and the exhibition is among the largest undertakings in recent museum history, with the institution anticipating more than 100,000 guests to descend upon the DIA from across the United States, Canada, and Mexico. The exhibition also serves as a sort of coming-out party for the DIA. During the Detroit’s historic 16 months in bankruptcy proceedings, it faced constant scrutiny when former emergency manager Kevyn Orr had its extensive collection appraised as he considered ways to shore up some $18 billion in debt. DIA Executive Director Graham Beal says the exhibition is more than a decade in the making, and that it’s especially healing to have it debut now that the city’s bankruptcy proceedings are in the rearview mirror. “I’ve always intended to revisit the circumstances during which the murals were being made,” Beal says. The bankruptcy ironically seemed to have a mobilizing effect within the museum community, with institutions throughout the United States and Mexico keeping a close watch on what happened to the DIA. Relationships with the Museo Dolores Olmedo in Mexico City helped to obtain hard-to-get loans of both Rivera and Kahlo’s works. 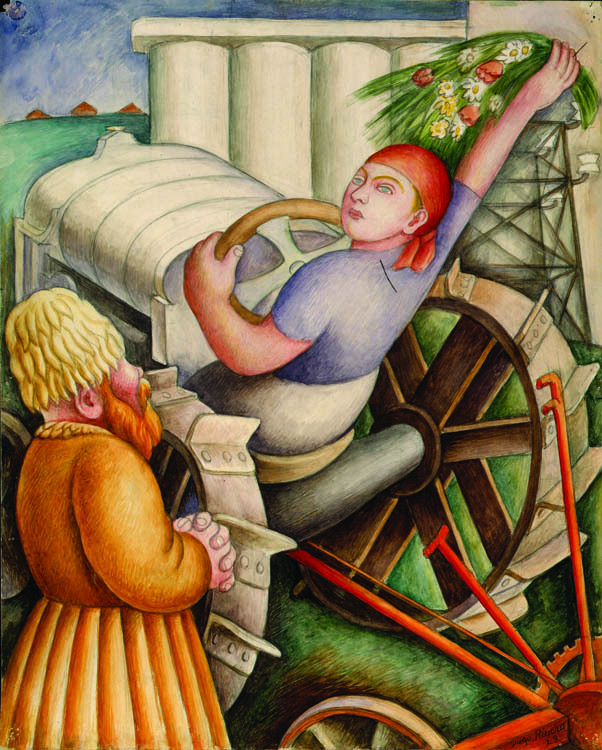 And the San Francisco Museum of Modern Art lifted a three-year moratorium on loans during its renovations exclusively for the DIA so that Kahlo’s newlywed painting of her and Rivera, housed at the California institution, could be included. To capture the essence of the era, the DIA asked a panel of experts in various fields for their input, says journalist Louis Aguilar, who was brought in because of his background reporting about the famous Mexican couple’s stay in Detroit for The Detroit News. In 2010, he won a Kresge arts fellowship in which he created a multimedia performance dramatizing their experience in the Motor City. He’s writing a book about Rivera and Kahlo’s time in Detroit. 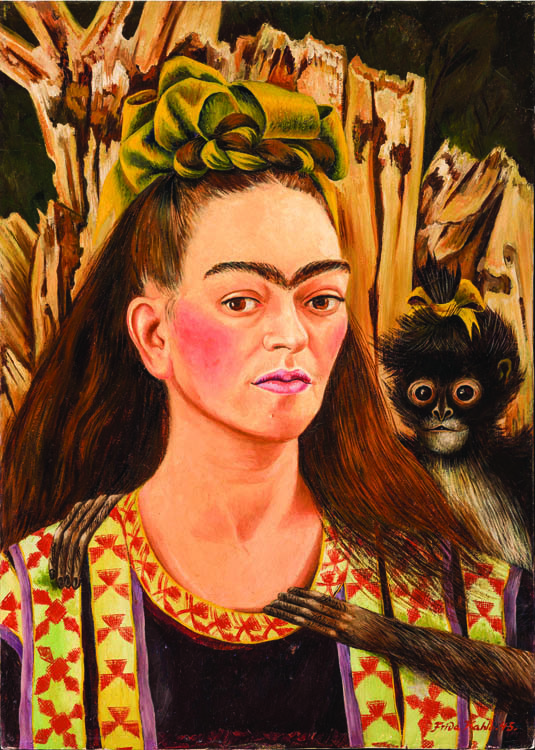 “It was so cool to hear several deans of medical schools talk about the emotional state of Frida Kahlo,” Aguilar says, adding that the group also tried to obtain medical records from Henry Ford Hospital to find out exactly what happened to Kahlo, who depending on who’s asked either had a miscarriage or an abortion in Detroit. PRIZED FRESCOES: The Detroit Industry frescoes above are among the most loved works at the Detroit Institute of Arts. The Rivera Court stands as an important artistic statement about North American capitalism. Between April 1932 and March 1933, Diego Rivera and Frida Kahlo spent time in Detroit when he was working on the frescoes. They feature everything from the manufacture of poison gas bombs to autos. Several preparatory drawings in charcoal will be on display during the exhibit. As for the work itself, obtaining loans from Mexican museums proved to be tricky had the DIA not had established relationships with the Olmedo. Other arts institutions like the Museo Frida Kahlo in Mexico City, for example, which gives recognition of Rivera and Kahlo’s time in Detroit with photos of the couple’s time in the Motor City adorning the museum’s walls, would not allow its works to travel to Detroit. The museum, also known as La Casa Azul (formerly Kahlo’s estate), holds scores of photos and letters signed by Detroit’s elite, including several members of the Ford family. Hilda Trujillo Soto, the museum’s director, says she was not able to grant any loans, but did her best to guide the DIA’s team on what ground needed to be covered to have a successful exhibition. 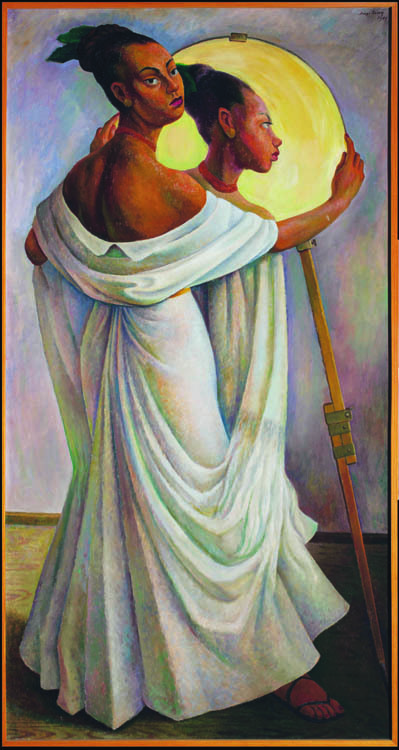 The Portrait of Ruth Rivera is by Rivera. There were, of course, works that had they not been loaned to the DIA, would have severely hampered the quality of the exhibit, including the Henry Ford Hospital painting — among the first pieces created by Kahlo that can be instantly recognized as her style. “Right away, if you don’t have that, you’re going to have a very different exhibition,” Beal says. 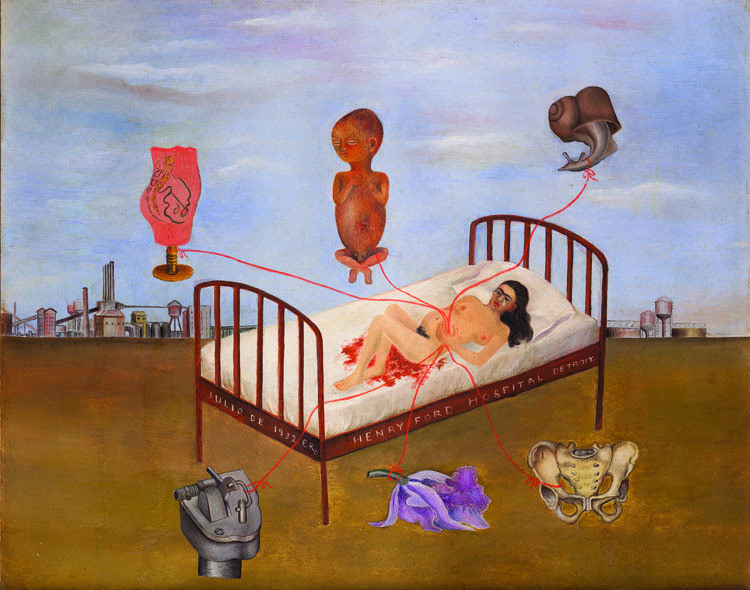 LIFE-ALTERING: A painting titled Henry Ford Hospital was among the first pieces created by Frida Kahlo that can be instantly recognized as her distinct style. Her work continues to inspire countless female artists. 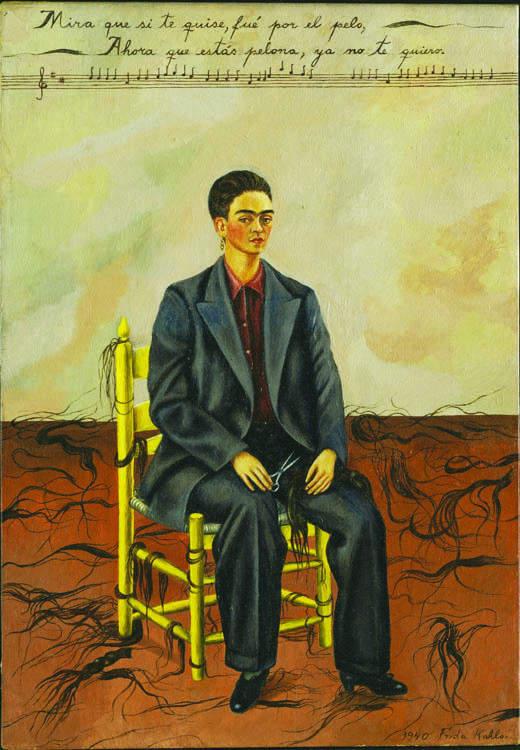 Kahlo’s style is timeless, reflecting a vulnerability that women and men can relate to across the globe: the striking, yet disarming expression on her face, her hair tightly braided and topped with a floral crown, her long, flowing Mexican dresses, juxtaposed at times against shocking glimpses into the depths of sorrow. 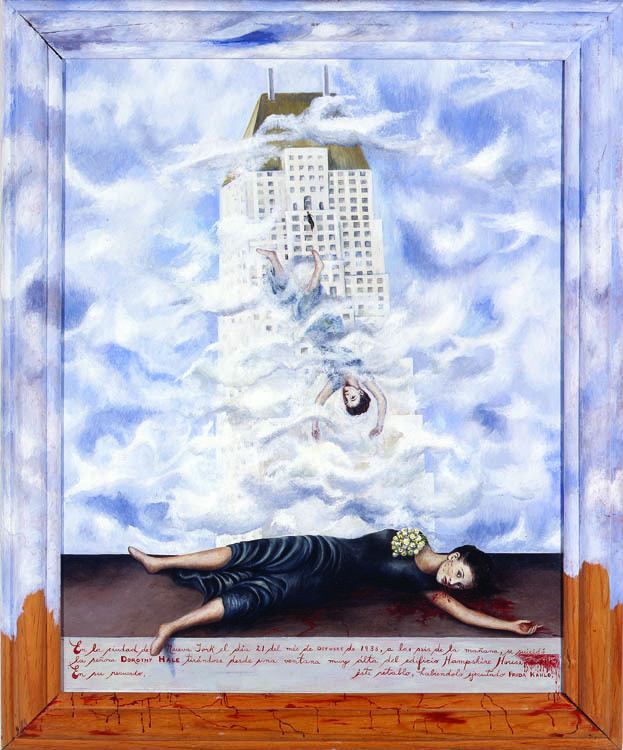 One of her most important works, Henry Ford Hospital, shows a naked and bloodied Kahlo huddled on a hospital bed, with an aborted fetus and her sexual organs floating outside her body, attached by umbilical cords, and it’s clear that Kahlo suffered mostly in silence countless injustices to her mind and body. Feminists call her work revolutionary. Her image inspires pop culture legends like Madonna, who owns among the largest collections of Kahlo’s work outside of Mexico. Even here in Detroit, her fashion continues to be celebrated in the Park Shelton boutique, called Frida. And unlike Rivera’s work, which remained tied to a specific period, Kahlo’s work seems as revolutionary now as it did in Depression-era Detroit. Falini has been following Kahlo for nearly 20 years and runs the fan site, fridakahlo.it, in which she’s published a number of essays about the artist, tracks exhibitions around the world, and gives readers, who hail from all over Europe and North America, an extensive history of Kahlo. 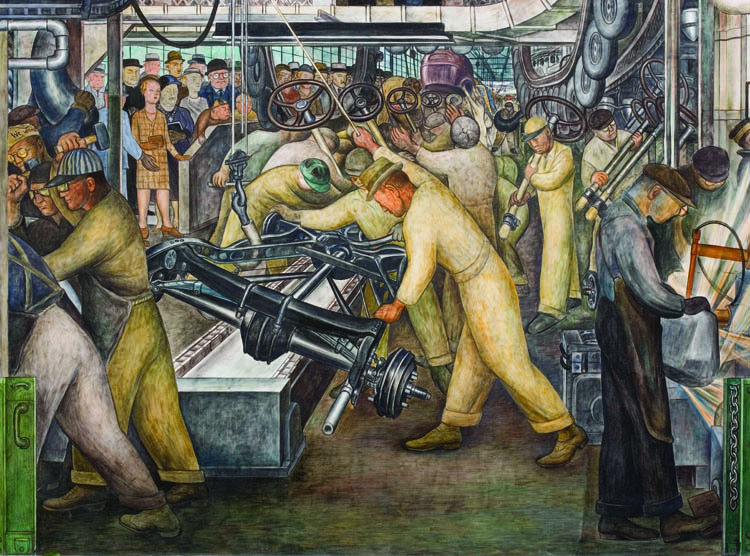 AT THEIR PEAK: Mexican artist Diego Rivera was already a famous name when the Detroit Industry frescoes (left) were being created. But at the time, Frida Kahlo was relatively unknown, aside from being Rivera’s third wife. That changed while the two were living in Detroit, where Kahlo began to develop her style. Kahlo painted the oil on canvas, Self Portrait with Cropped Hair (right), in 1940. But what is the genesis of Kahlo’s famous style? How did she go from loyal if not scorned wife to an adulterous husband, whose work prior to 1932 was considered naïve at best, to one of the most important painters of the early 20th century? 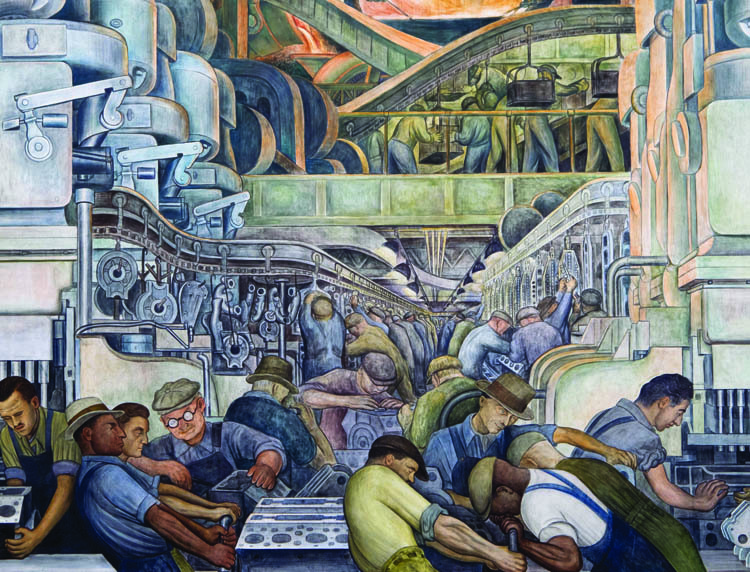 The lore surrounding the controversy of Rivera’s Detroit Industry murals remain as intact as the massive paintings themselves. But while Rivera’s career had in many ways already peaked by the time the couple made it to Detroit, hers was just getting started and really only took off during her fateful hospital visit at the New Center hospital. In his research, which involved scouring old newspaper articles, Aguilar found that Kahlo’s identity really started to take shape in Detroit. 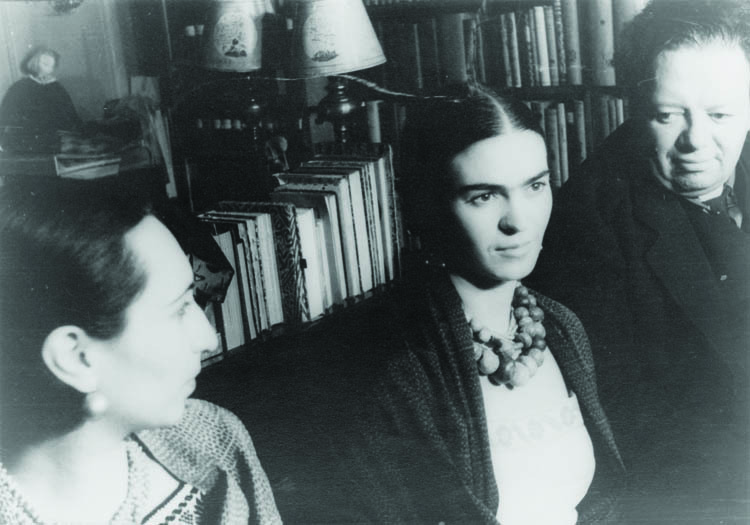 Rivera and Kahlo, who both share Jewish lineage, were concerned they would be driven out of Detroit because of the deeply rooted anti-Semitism of the time, so Kahlo used one of her middle names, Carmen. That soon dropped off and she switched back to Frida, sometimes spelling it Frieda or Freda. She also started dressing more in line to what would be considered “Mexican” attire. Rivera belonged to the Mexican Muralist movement in post-Revolutionary Mexico, which sought to provide a visual narrative of the country’s history. While Rivera was being commissioned to share his vision in New York, San Francisco, and Detroit, Kahlo used her clothing to do the talking, Soto says. That meant wearing those brightly colored skirts, intricate headdresses, and embroidered peasant tops. The DIA’s Beal says Kahlo’s style, both as an artist and a woman, was heavily influenced by her time in Detroit. “Frida found being in Detroit traumatic enough; she was very unhappy and uncomplimentary toward being here.” The painting served as her emotional and spiritual outlet. The fashion was her way to differentiate herself in a still largely provincial, industrial town. Today, her works continue to serve those purposes to legions of fans. And Rivera’s work, of course, remains a visual legacy of Detroit’s automotive might. 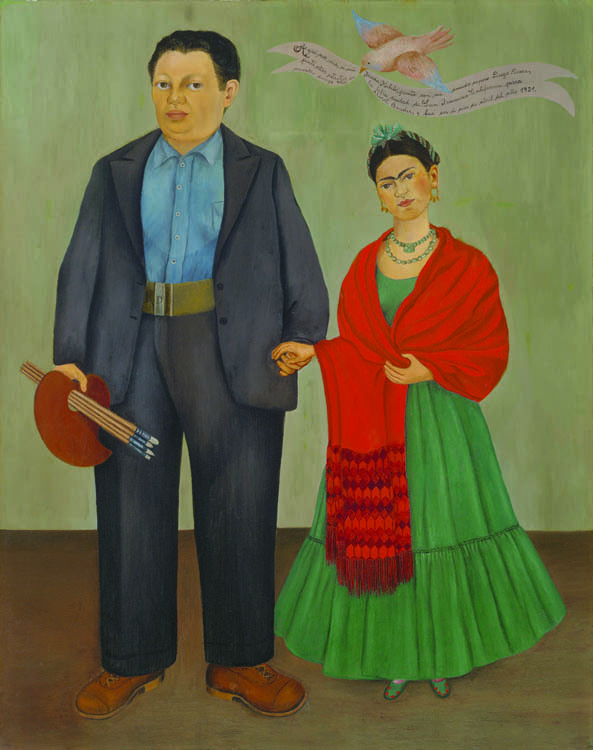 Diego Rivera and Frida Kahlo in Detroit is to run March 15 through July 12, 2015. Presale tickets are now available. Visit dia.org for more information. One can certainly add Robert Xavier Rodriguez’s 1991 opera Frida, based on painter Frida Kahlo, to that list. 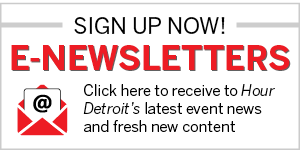 Coinciding with the Detroit Institute of Arts’ (DIA) exhibition Diego Rivera and Frida Kahlo in Detroit (March 15-July 12, 2015), Michigan Opera Theatre (MOT) will present Frida in March — but not at the Detroit Opera House, its usual venue. Instead, Frida will be mounted at three different locations in as many counties — the Macomb Center for the Performing Arts in Macomb (March 7-8), the Berman Center for the Performing Arts in Oakland (March 21-22), and the Detroit Film Theatre at the DIA in Wayne (March 28). Kahlo was once often referred to condescendingly as “Diego Rivera’s wife,” and an artistic dabbler whose talent was dwarfed by her husband’s. But through the years she has emerged culturally and academically as an important artist in her own right. Dynamic Dabbler: Self Portrait with Monkey, by Frida Kahlo, 1945, oil on MasoniteComposers don’t write operas based on boring people. Just consider a few based on real individuals: Tchaikovsky’s Jeanne d’Arc (Joan of Arc), Richard Danielpour’s Margaret Garner, Stewart Wallace’s Harvey Milk, Virgil Thomson’s Lord Byron, Deborah Drattell’s Nicholas and Alexandra, or Michael Daugherty’s Jackie O. They may be flawed or controversial, but they’re dynamic. “The fascinating thing about Frida as a person is that she’s far eclipsed Diego,” says MOT’s founder and artistic director David DiChiera. “She has become such an icon. I’ve run into people who don’t know much about opera, but they know about Frida,” he says. To DiChiera, it was important to cast the opera with Latinos. The part of Rivera will be sung by Mexican-born bass-baritone Ricardo Herrera. Composer Rodriguez was born in San Antonio, but is of Mexican extraction. The director, José Maria Condemi, hails from Argentina. If you expect to hear a grand opera in the mold of Verdi or Puccini, think again. Frida, with monologues and lyrics by Migdalia Cruz, uses an intimate chamber group of musicians that even play mariachi selections. The two-act opera will be performed partly in Spanish and English. It follows Kahlo’s life (1907-54), dramatizing such pivotal events as her horrific accident at 18 when the bus she was riding on collided with a trolley; her marriage, divorce, and remarriage to Rivera; her miscarriages; her art; and her death. DiChiera, who as artistic director casts all of MOT’s operas, says he believes he’s found the ideal woman in Cuervo to portray the tempestuous and tragic character of Frida Kahlo. “Casting this was very challenging for me because this is an opera that needed Latino singers — that kind of authenticity,” he says. “I knew of Catalina because of her success in [Astor Piazzolla’s tango opera] Maria de Buenos Aires. “So, I flew her here and she auditioned and was really good and exciting, and I loved her personality. For tickets, call MOT at 313-237-SING or go to michiganopera.org. Also check out theberman.jccdet.com, dia.org, and macombcenter.com. Shocking Commision: Frida Kahlo was commissioned to produce a “remembrance” of an American socialite and aspiring actress who killed herself. This graphic portrait, Suicide of Dorothy Hale, was the unexpected result. The DIA’s Diego Rivera and Frida Kahlo in Detroit and MOT’s Frida are spawning a host of ancillary events. Detroit Industry wouldn’t have existed without the assistance of Edsel Ford, who bankrolled the frescoes. The son of Henry Ford was a talented auto designer and an art aficionado. So it seems only natural that the Edsel and Eleanor Ford House in Grosse Pointe Shores would want to tie in an exhibit of its own. Beginning April 1, Diego and Edsel: Designers of the 1930s will offer visitors to the Ford House an opportunity to enter “The Studio,” an interactive exhibit space devoted to celebrating design of the ’30s. Guests can look at design objects, artists’ tools, and flip through magazines of the era. There will also be art lessons, hands-on art projects, tours, and a studio crawl. The events will end in June. Michigan Opera Theatre is going all out in the community to bring attention to Robert Xavier Rodriguez’s Frida. MOT will offer several “opera clubs” that will introduce people to the opera “neighborhood by neighborhood.” The informal gatherings will be held in Ann Arbor, Grosse Pointe, Livonia, Birmingham/Bloomfield, and Detroit’s Palmer Woods/Sherwood Forest, Boston-Edison/Arden Park, Indian Village, and Rosedale Park neighborhoods. MOT will also present “Overture to Frida” at the University of Michigan Museum in Ann Arbor and at Flint’s Whiting Auditorium. Programming was still being set at press time. At 11 a.m. March 6, there will be a special seniors/students dress rehearsal of Frida at the Macomb Center. In March and/or April, MOT will present a small touring children’s opera, How Nanita Learned to Make Flan, by José Enrique Gonzalez Medina. The opera will be presented in a dozen schools in southwest Detroit, which has a large Latino population. Go to michiganopera.org for additional information. At press time, the DIA was still ironing out details about additional activities, but there will be a Frida opera dress rehearsal on March 26 and an educators open house on March 13 to familiarize teachers with the art of Rivera and Kahlo. For the latest info, go to dia.org.